One of my favorite parts about my job is being a member of the INSIDER Spirit Squad. Every 2 weeks, my office dresses according to a particular theme. We take a group photo and give awards to those who best embodied the day's theme. The Spirit Squad takes the office's suggestions for themes and organizes when and what each theme day will be. 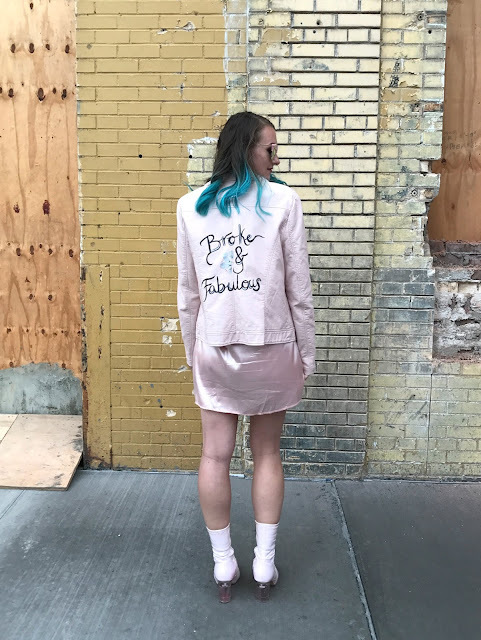 I actually wore this jacket for our 2nd theme day – Millennial Pink Day (a theme which was chosen based on an article I wrote a while back). 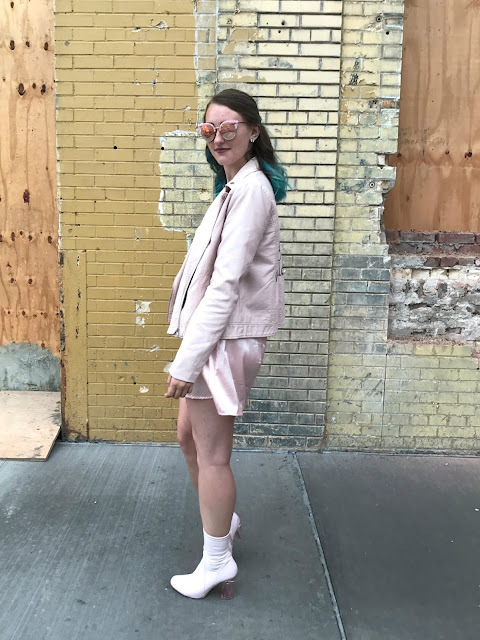 A couple weeks ago, the Spirit Squad was talking about what it means to best embody a theme, and the concept of the definition of style came up. 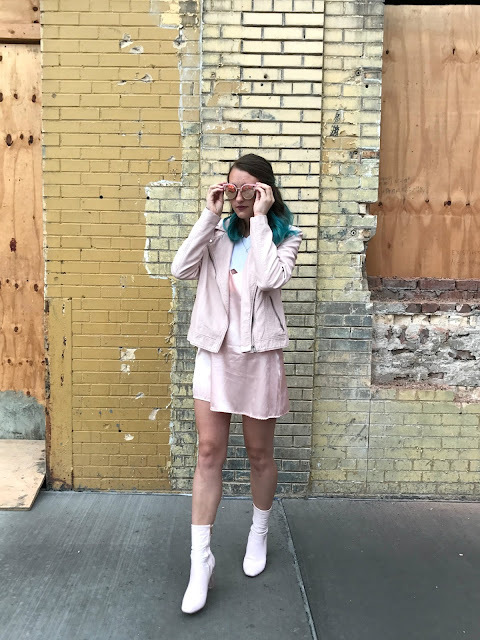 Kyle, another Spirit Squad member and the person behind the camera for the photos in this post, said that fashion is about trends, while style is about wearing things in new and unexpected ways. This definition places emphasis on how something is being worn as opposed to what is being worn. Josie said that one's sense of style depends on wearing what makes them feel best. Personal style, then, could prioritize fashion trends, comfort, making a statement, emanating a particular persona, etc. I've always regarded style as a form of self-expression, while fashion refers to the industry which chooses and advertises trends each season. That's why I consider myself a "style blogger" instead of a "fashion blogger". My definition of style, then, is a mix between Kyle and Josie's definitions. For me, self-expression entails a number of different things. First and foremost, dressing to express myself means dressing to show the world who I am. I'm creative, thoughtful, intelligent, and witty. 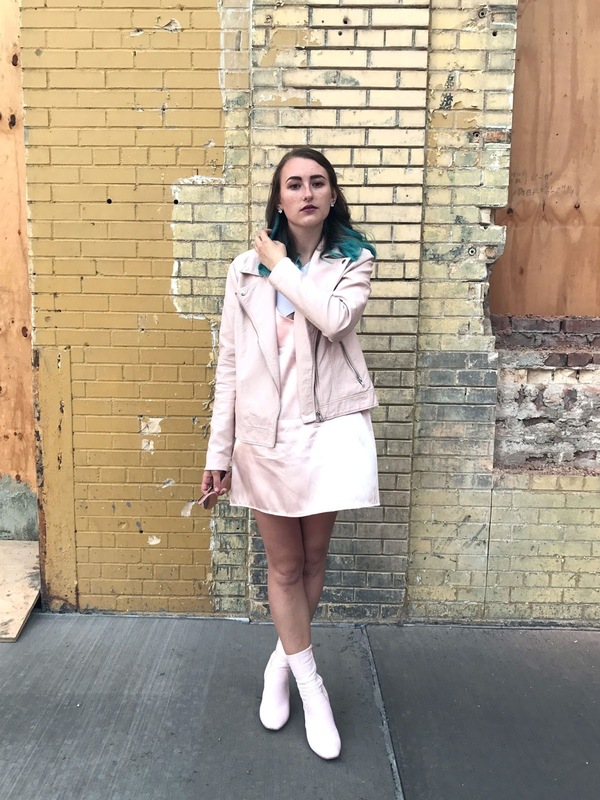 My creativity shows in the unique pieces and combinations I wear. I'm thoughtful in how I put together my outfits, paying attention to detail and dressing appropriately for the weather and whatever environment I'm going to be in. I like to be smart about what I wear, keeping in mind where my clothes and favorite fashion trends come from. I often throw a little bit of whimsy into my outfits, like the dog socks I'm wearing under these boots. Self-expression also means wearing things that say something about me. This jacket is an obvious example, as it displays my blog name in my own handwriting. You can't tell in these photos, but I'm also wearing a necklace with a scorpion on it, because I'm a Scorpio. Pink is my favorite color, so I wore an outfit composed almost entirely of it. 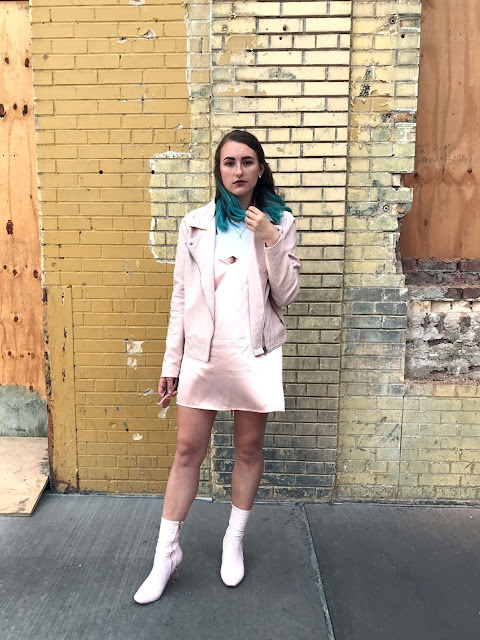 While I don't prioritize following trends by any means, I do like being inspired by what's "in" in fashion, and choosing to wear trends that I like outside of their importance in fashion. This slip dress, for example, is a huge street style trend right now. 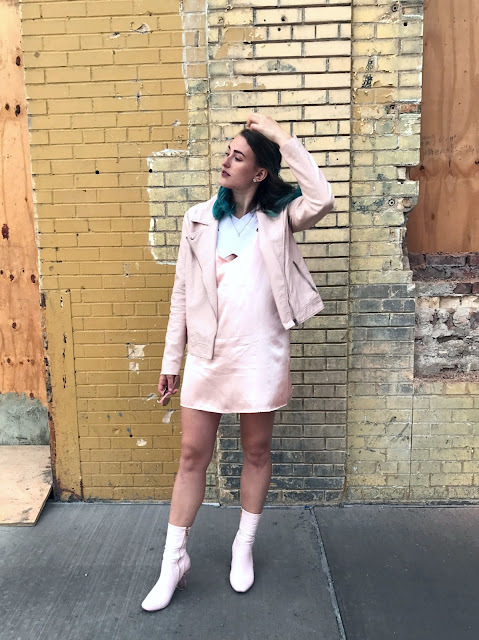 When I saw shots of celebrities walking around in slip dresses, I remembered being in middle school and finding a silk slip (like, the kind you wear under a dress) in a box of hand-me-downs. I tried it on and modeled it for my mom, declaring that I wanted to wear this dress to my Bat Mitzvah. I genuinely don't remember if my mom was horrified or amused, but I can tell you I wore a real dress to synagogue for my Bat Mitzvah. 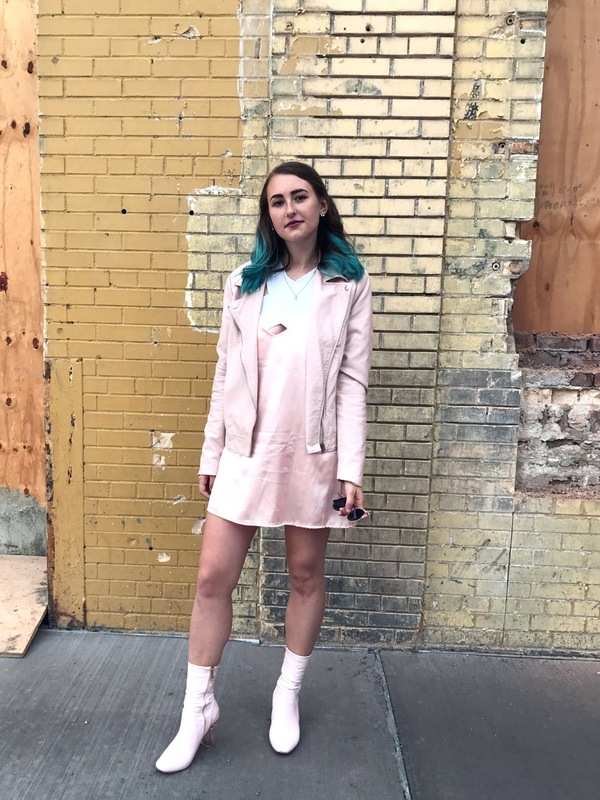 So, learning that this was now an appropriate style to wear in public inspired me to purchase a slip dress for myself. Comfort and aesthetics play a huge role in my sense of style. I love this shirt because I can wear it without a bra. Wearing a bra always makes me just a little more uncomfortable, whether due to the underwire or the straps. This dress kind of feels like wearing nothing, an ideal bodily sensation. I've been big on leather (well, faux leather) jackets since high school. I couldn't tell you what it is I like about them, but I find them aesthetically pleasing enough to have 2 of them. 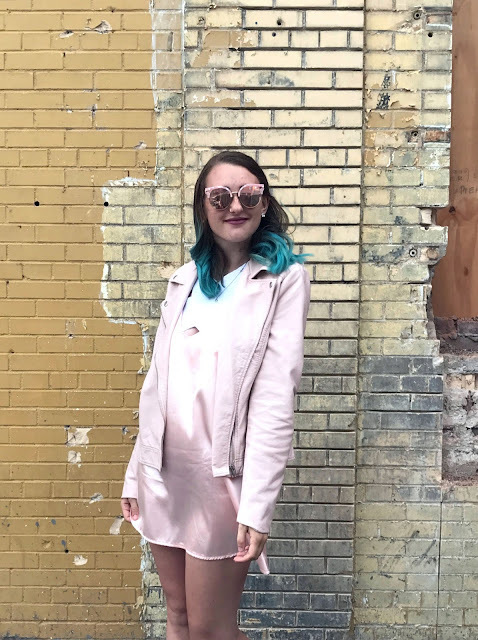 I've already mentioned that pink is my favorite color, so I've been figuring out how to wear pink since before millennial pink became a ~thing~. Finally, I'd be lying if I said my style was completely unique to me, uninspired by others. 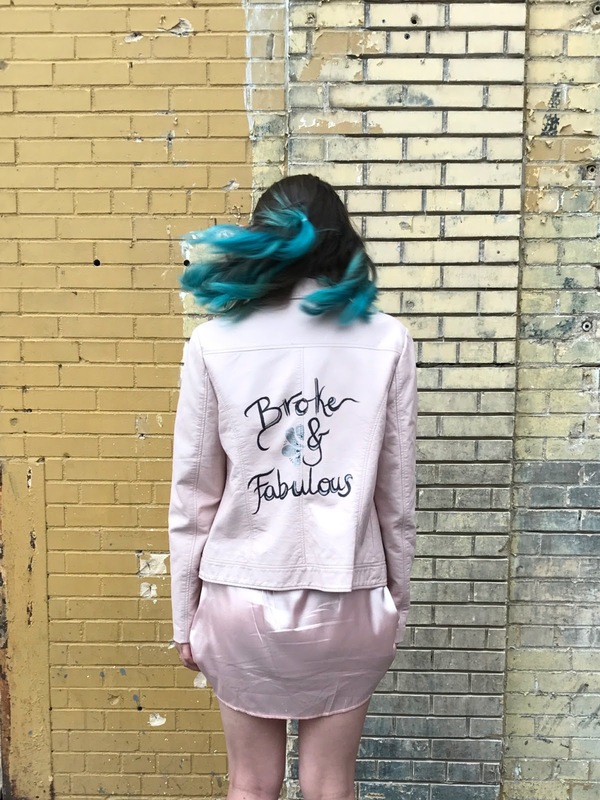 I've wanted a personalized jacket with my blog name on it since seeing Payton of Hustle + Halcyon and Dani of Mermaid Waves rock theirs. 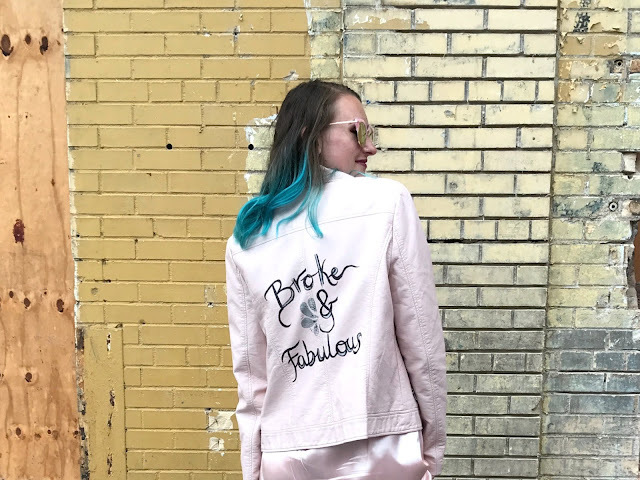 I had originally intended to embroider a denim jacket with Broke & Fabulous, but I have much more experience painting, and this jacket is just such a perfect representation of my blog. How do you find and define your sense of style? Comment below to let me know!